In a caring and affluent society like Canada, it is unacceptable that any young person would become entrenched in homelessness as a result of family breakdown and systems failures. Despite little evidence that we are reducing youth homelessness, we continue to rely on crisis responses such as emergency shelters and day programs. Even worse, it is objectionable to simply rely on a crisis response to address the issue, exposing young people to harm and expecting them to “bootstrap” themselves out of homelessness. 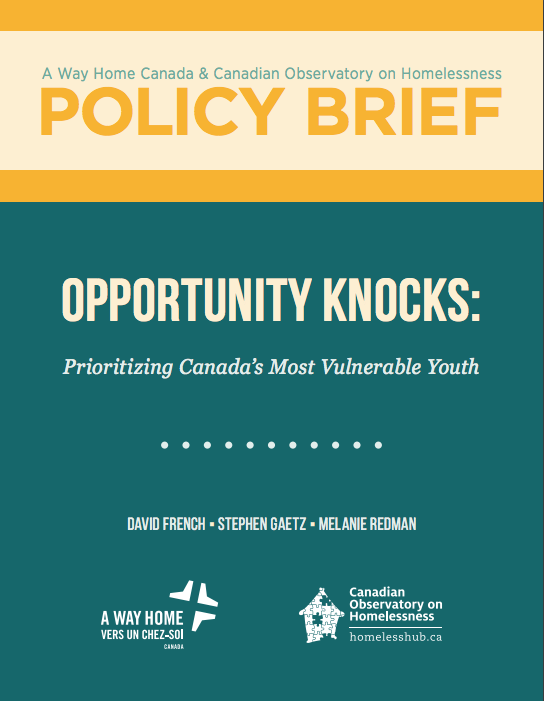 Numerous studies have demonstrated the harmful consequences of allowing young people to remain in an extended state of homelessness, and yet few communities in Canada have youthspecific systems or strategies to help them transition quickly into housing. In this regard, we are not making sufficient progress and too many young people remain stuck in homelessness. Increased resiliency in homeless youth and youth at risk of becoming homeless. The renewal of the national strategy on homelessness presents a real opportunity to transform how we address youth homelessness in Canada, by moving from managing the crisis and putting young people at great risk, to an approach that focuses on the health and well-being of young people and assisting them to transition to adulthood in a safe and planned manner. The Government of Canada can show great leadership in this regard through making prevention and ending of youth homelessness a priority within the renewed national strategy. This means retaining current investments in Housing First and other community supports but also a dedicated investment in, and prioritization, of youth homelessness.